You may have seen that we’re once again encouraging pie fans and pie companies to make promises regarding pies for British Pie Week (from 2nd to 8th March 2015). This is in the form of making a #PiePledge or two, possibly committing to eat more pies or try a new pie flavour or do special pie-motions to celebrate pie! But it would certainly be hypocritical of us to ask you to make a #PiePledge without making a few ourselves, so over the coming days we will be revealing the various #PiePledge ideas the Pierateers will be committing to! It has to be said that it's going to be hard to beat some of the #PiePledge ideas we had last year, but we'll give it a try! Of course, there's no beating the pie-thon (python pie) Pierateer Tim made in terms of a piefect pie pun, and it was an epic feat for Pierateer Sam to make a video of all 21 consecutive pie meals he ate in British Pie Week 2014 whilst losing weight, but we have a few pie-deas to ensure British Pie Week 2015 is pastry crazy! Possibly the most important thing we found out last British Pie Week: Pies don't make you fat! We encourage you to read about and watch the videos of how Pierateer Sam ate 21 consecutive pie meals during British Pie Week 2014 and LOST weight! Seriously! Pierateer Rob will be doing a 50-50 Pie Challenge, in which he aims for pie to be at least 50% of his diet during British Pie Week 2015! While still unsure quite how he's going to consume that much pastry in a week, he's up for the challenge and will record his pies and non-pies in our daily posts! This is not going to be healthy!!! Pierateers Rob and Sam both aim to compete in a Pieathon - where they will both aim to see how many hours (and hopefully days!) they can survive on just eating pie until the craving for a non-pie option becomes too strong! Starting at Midnight on Monday 2nd, they will only eat pie until one of them cracks under the pie-ressure! You can see timers of how long we lasted in our Pieathon post. We're pleased to announce that we will be supplied with pies for some of these challenges by Nice Pie, Pieminister and Toppings Pies. We look forward to reviewing these and taking us past 500 pie reviews in our Pie Rankings table very soon! 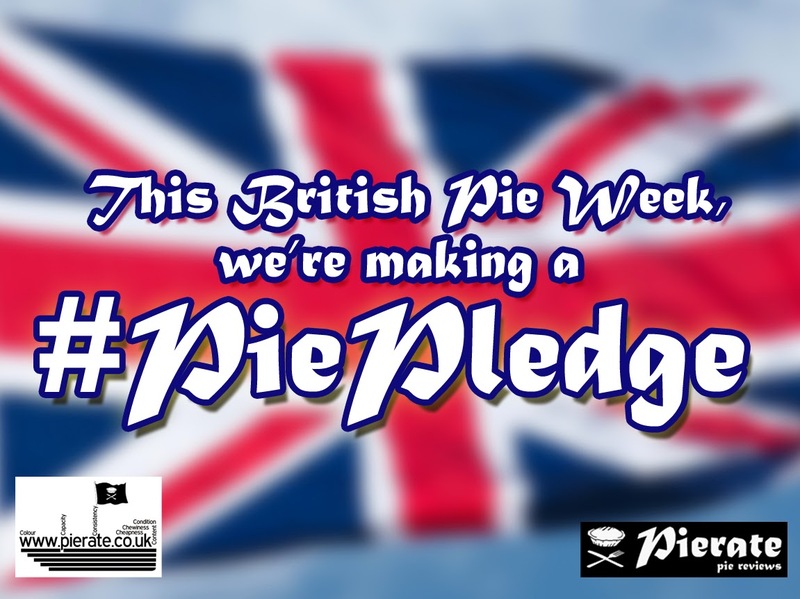 The #PiePledge by Pierateer TJP will be attempted outside of Britain! Will he be able to take the spirit of British Pie Week abroad as he travels to Greece? The Ship's Cook has made a #PiePledge to "push the boat out" (so to speak) by attempting a new reci-pie in British Pie Week. We'll find out what in British Pie Week! The Pierateers #PiePledge to do a day-by-day account of every pie they eat in British Pie Week! Check back daily on www.pierate.co.uk to see what crazy pie antics we’ve been up to during the week! Pierateer Rob has gone the extra mile by committed to take 3 days off work to help aid this regular pie review posting! Plus as he's eating so many pies anyway, Pierateer Rob will #PiePledge to eat at least one pie all seven days of British Pie Week! Check back daily on www.pierate.co.uk to see what pies we've consumed each day! Don't forget though that you can get involved too! Check out our #PiePledge video above or check out our #PiePledge article. And follow the #PiePledge hashtag on Twitter for how we're doing! - In British Pie Week 2014 they went much, much further with so many Pie Pledges it needs its own Pierateers #PiePledge 2014 article!